Usually when I make stir fried vegetables I do not include vegetables like bok choy or shanghai until recently when I saw it in a dish we ordered in a Chinese restaurant near our place. Before those green leafy vegetables for me is reserved for soups or consumed on its own with oyster sauce, I never imagined it would be good with stir fries, I was wrong. I am not sure if you tried using it in other dishes but this is my first time using it like such and here is a free style recipe I used it with. Now I guess I will be using it a lot in stir fries, it is so good! Place water in a pot then bring it to a boil, blanch Shanghai and snow peas then drain and rinse with running cold water, set vegetables aside. Add oil to wok then quickly cook squid and prawns in really high heat. Remove seafood from wok then set it aside. Still in high heat add ginger and shallots then stir fry until fragrant. Add fish balls and stir fry for a minute. Add carrots and straw mushrooms then stir fry for a minute. Dissolve cornstarch on seafood stock then set aside. Add cooked vegetables to the wok give it a quick stir then add the seafood stock mixture, bring to a boil. Add the cooked seafood then season with fish sauce and freshly ground black pepper, stir to distribute sauce evenly. Drizzle sesame oil on top then turn heat off, serve. The pink shrimp are making my mouth water….so delicious looking. I love stir fry dishes and yours definitely looks delicious! Your food always makes me hungry Raymund, even when I have just eaten. 😉 This is no exception! i second Geni. This looks amazing. Living mostly alone, liking healthy & tasty food and wanting to be pretty speedy in the kitchen I cook a lot of stirfries: nifty way to have something quite different every time and use up what needs to from the fridge also 🙂 ! Must admit I have always used bok & pak choi and all the other leafy Chinese vegetables whilst doing so: it just means separating the leaves form the stalks and cooking these a slightly different time 🙂 ! Yup those are shot outside usually around 7PM in summer time so no more glaring light. I’ll take stir fried seafood any day and everyday! I have decided to decrease my meat comsumption this year so that means I’ll be having more seafood and veggies. This recipe will come handy when I do my next round of seafood cooking. Thanks for sharing! I’m a new seafood eater so a lot of these ingredients are new to me, but it looks tasty and very pretty as usual! I love greens in stir-fries! They’re so good in every stir-fry I’ve tried them in. Gorgeous colors in your dish Raymund, it looks divine. 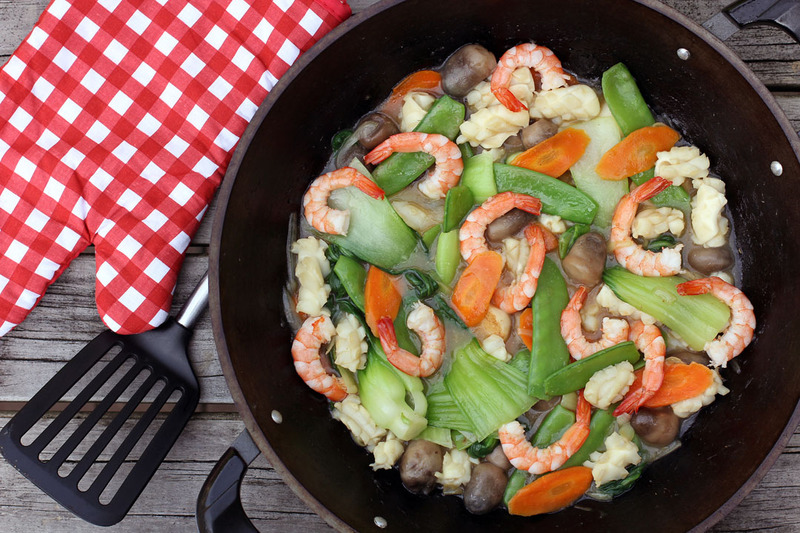 I LOVE stir fry veggies, but adding seafood to it just ups the delicious factor. This sounds amazing. I have to try this, I used to eat a dish called Rice with white sauce. it was place in a mould and the center filled with similar to or the above filling you have reciped. Rice was then tamped on the base and when released onto the plate a little more chinese white sauce was poured over the mould, it was totally wonderful, and this is the closest recipe I have been able to come to re the recipe – thank you.